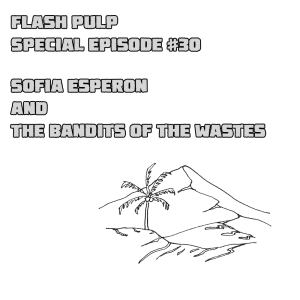 FPSE30 – Sofia Esperon and the Bandits of the Wastes | Skinner Co. Welcome to Flash Pulp, special episode thirty. This week’s episodes are brought to you by the Freelance Hunters! Tonight we venture out with Queen Sofia Esperon as she undertakes a perilous mission of mercy. A thousand harnessed cargo scorpions drove a straight line across the windswept desert, and, though the edges of the column were easily lost within the great sandscape’s grit-stained borders, Sofia Esperon, Queen of the Hundred Kingdoms, led them without concern from her position atop the foremost carapace. This was not the ruler’s first venture across the Great Waste, and she faced the sun in a flowing collection of white robes that imitated the self-spun silks worn by the badlands’ mantis-people. Sharing a platform with her gently rocking wicker seat was Jondis Malhammer, the Viceroy of Miscar, a city of the southern provinces. The humid vineyards and orange skies of Miscar were as alien to this land as the Viceroy to the unrelenting heat, and the thin-haired man was endlessly running his fingers through his dagger of a beard and complaining on the topics of dust, sun, and chafing. To keep him from having an opportunity to speak, Sofia had taken to recounting her previous incursion through the area to her handmaid, Ida. “Fifty years before my reign, when the Hundred Kingdoms first waged war against the mad wizard Kemrolth, the sorcerer attempted to open a portal to a hell dimension where the heart of the wastes now stands. Though the hole in the fabric of reality had been held wide only but a moment, the heat of the beyond was enough to incinerate the warlock and most everything within two-hundred leagues. “Shant was the exception. It’s Mayor Queen, Meb, had spent her reign endlessly shoring up its walls, first with stone, then with iron, then, finally, with magicks. “Though once a capital teeming with merchants of many lands, most of the original inhabitants, lucky to have survived, fled the city once they realized its supporting farmlands and rivers had been rendered to ash and dust. It was mostly the mantis-folk, outcast from their ancestral lands decades before but having found a warm welcome at Meb’s gates, who stayed on. “Now it is mostly forgotten that this was not always where the green men of the dunes called home. “A decade ago, when Mayor King Klim, third successor to Meb, sent an envoy to ask if I might provide assistance in exchange for an oath of fealty, I will admit I had little interest in this sandbox. As with any citizen of a state that warred with Kemrolth, however, the creation of the wastes are my stain to bear. The Queen’s brow creased, but, before she might provide her own thoughts on the matter, an enlarging speck on the horizon caught her attention. Adjusting the eyeglass she’d had mounted onto her buck scorpion’s harnessed platform, she leaned forward. A group of a dozen mantismen had breached the skyline, their silks gleaming as brightly as the curved blades affixed to their forward pincers. Without shift in pace or direction, the rise and fall of their transport’s towering legs continued until the newcomers were within shouting range. Though engulfed in the shadow of the lead beast alone, the group set itself in the column’s path and brandished its cutlery. It was Sofia herself who replied. The knot’s commander acknowledged the charge with but a shrug of his thin shoulders. Turning to the Captain of the Royal Guard, Esperon laid out a series of precise commands, and the word was passed down the line. An arm of wood and rope swung wide of the third transport, and a cache of supplies, equal to those allocated to a dozen of Shant’s citizens, were lowered onto the dust. Then, with a nod from the Queen, the caravan resumed its pace, and the bandits were soon only visible by the broad tan hunting shields they wore across their back. Though Sofia caught a frown upon Malhammer’s face, she said nothing. The Viceroy was well distracted by a tale of his own hunting prowess when, as dusk fell across the dunes, a second sighting was made. On this occasion it was Ida’s stiff finger that brought the crook-handed strangers to their attention. At a dozen points the sands shifted, then hunters appeared from beneath the shields they’d used as a dust-covered roof to obscure their hiding holes. Their stalking spiders – no smaller than the hounds Esperon herself had preferred in the years when she’d been forced to pursue her own bear meat – took up a position of menace. There was a moment of silence as the Miscarian’s words caught in his throat, then the stripes of ocean blue paint that adorned this new cluster became clear in his view. Red streaked the sky as the day’s light made its last goodbyes from beyond the drift-ridged horizon, and, this time without a word to the interlopers, Esperon again relayed her orders. Within moments a second allotment of the supplies bound for Shant were measured to supply the bandits at hand and then lowered. “You are a magistrate of greater tenderness than I,” muttered the Viceroy. “If I wasn’t a woman of great patience you wouldn’t be here,” replied the Queen. Heeding the edge in her voice, the Viceroy allowed darkness to fall across the advancing convoy in a hush. In the deepest darkness, as the Queen and her party dozed, the true bandits arrived. They made no noise, for their intention was not to communicate but to take – and so the Queen’s Captain did not bother to awaken her until dawn broke. “Hurrah! We’ve finally squashed some of these filthy bugs,” responded the Viceroy, the tale of violence and his morning tea having lent his tongue energy. The march continued in silence until noon, when Shant came into view. Its red walls, as tall as the scorpions themselves, stood firm against the shifting terrain about it. Elephantine runes had been etched across its face, and encircled its gate, and the shadowy depths of each character held, in turn, a scrawling library of symbols. “I see now why you felt this mission to be so critical,” the Viceroy told the Queen. So it was that relief supplies were not all that was left behind upon Esperon’s departure, and Jondis Malhammer came to learn the truth known by those made to understand the nature of the Great Waste.